beIN SPORTS Americas is a large sports network covering the United States and Canada. It is part of the beIN SPORTS international network owned by beIN Media Group. It covers various sports, including soccer and beach soccer, rugby, motorsports, boxing, cycling, handball, horse racing, judo, tennis and volleyball. beIN SPORTS’ soccer coverage in USA and Canada is backed by broadcast rights to key competitions such as the Spanish La Liga and Copa del Rey, Italian Serie A, French Ligue 1, French Cup and Coupe de La Ligue, English Championship, FIFA World Cup Qualifiers, international friendlies and AFCON Qualifiers. The network also produces original content such as its flagship sports shows The Express and The Locker Room. Live matches are usually aired on television channels beIN SPORTS and beIN SPORTS en Español in English and Spanish respectively; however, the network’s digital platform beIN SPORTS Connect, which simulcasts the content available on TV, occasionally offers exclusive online and mobile streaming access to select games. As the broadcaster of multiple sporting events, including El Clasico – one of Europe’s biggest meetings in club soccer – beIN SPORTS has repetitively broken viewership records over the years, achieving high ratings on both its English and Spanish networks. fuboTV is a Soccer streaming service available on multi-platforms dedicated to bringing live soccer matches and programming to US soccer / football enthusiasts. fuboTV brings you Live and on-demand matches for select leagues and football clubs as well as access to a wide array of Soccer specific channels, and best of all, there is no contract! fuboTV is available on a month-to-month basis. Your subscription automatically renews until you choose to cancel. fuboTV offers all beIN SPORTS programming: beIN SPORTS en Español, beIN SPORTS, beIN SPORTS CONNECT (beIN SPORTS 1, beIN SPORTS 2, beIN SPORTS 3, beIN SPORTS 4, beIN SPORTS 5, beIN SPORTS 6, beIN SPORTS 7, beIN SPORTS 8, beIN SPORTS 9). In addition, you get alot more programming from other popular Soccer channels in the USA, such as: GolTV English, GolTV Spanish, Benfica TV, Sport TV Americas, RTP Internacional, Univision, Unimas, Univision Deportes, TyC Sports and much more. Try fuboTV before you buy with a free trial. fuboTV offers a wide range of live soccer from top leagues, such as: Spain's Primera Division, Italy's Serie A, Portugal's Primeira Liga, Mexico's Copa MX & Liga MX, MLS, France's Ligue 1, the Argentina and Uruguayan Primera Division, Copa America Centenario, CONMEBOL qualifiers and Benfica TV (includes Benfica home games), and more. Paquete Total: Includes beIN Sports en Español, Galavisión, Univision, UniMás, Azteca, AZ Clic, Univision Deportes and more. Brazil Mega Package: Includes beIN SPORTS. This package is targeted to Brazilians who are looking for Sports programming from Brazil: TV Globo Internacional, TV Record Americas, PFC, Band Internacional, beIN Sports en Español, Willow Cricket, TRACE Sport Stars, Eurochannel are also included in this packge. *You must have a basic package such as: Best of Live TV-Beta Multi Stream, Best of Live TV or Paquete Total in order to get any of the Sling TV add-ons packages listed above. beIN SPORTS en Español is a sports channel available to watch in the United States and Canada. It is property of beIN SPORTS International network, which is owned by the beIN Media Group. This channel covers a wide range of sports, including football and beach soccer, rugby, motor sports, boxing, cycling, handball, horse racing, judo, tennis and volleyball. beIN Sports en Español's football coverage inside the U.S. and Canada may include some of the best domestic leagues in Europe, including those from Spain, Italy, and France. Added to those leagues, beIN Sports en Español includes games featuring national teams, both competitive and friendly. This channel also produces original content, such as its flagship shows The Express y The Locker Room. All the content in this channel is broadcast in English by its counterpart, beIN Sports. 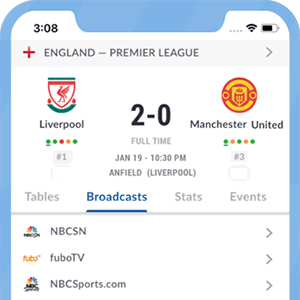 On-the-go coverage is provided by the network's straming service called beIN Sports Connect, which simulcasts content to subscribed users both on mobile devices and online. Which cable and satellite TV providers carry beIN Sports en Español in the U.S.? AT&T U-verse: beIN SPORTS en Español on channel 1663 in HD. Advanced Cable: beIN SPORTS en Español on channels 421 and 422 in HD. Atlantic Broadband: beIN SPORTS en Español on channel 234. Bright House Networks: beIN SPORTS en Español on channels 913 and HD on 1919. Cablevision Optimum TV: beIN SPORTS en Español on channels 230 and 1070 in HD. Claro Puerto Rico: beIN SPORTS en Español on channel 1630 in HD. Cox Communications: beIN SPORTS en Español on channels 372, 726 and 1372 (SD) or 1727 in HD. enTouch Systems: beIN SPORTS en Español on channel 495 in HD. DISH: beIN SPORTS en español on channel 871. DIRECTV: beIN SPORTS en Español on channel 426. Hotwire Communications: beIN SPORTS en Español on channel 873. Liberty Puerto Rico: beIN SPORTS en Español on channels 39 and 239 in HD. RCN: beIN SPORTS en Español on channel 808. Verizon FIOS: beIN SPORTS en Español on channel 1538 in HD. *Got itLive Soccer TV does not provide beIN SPORTS en Español live streaming. The information provided on this page is simply beIN SPORTS en Español soccer TV schedule. beIN SPORTS has the exclusive English and Spanish-language broadcast rights in the US for France's Ligue 1. Matches are shown on beiN SPORTS and beIN SPORTS en Español, as well as on its beIN CONNECT digital platform. beIN SPORTS has the exclusive multi-platform broadcast rights in both English and Spanish-language for the USA. La Liga matches are shown across beIN SPORTS network (beiN SPORTS in English and beIN SPORTS en Español in Spanish, as well as on the beIN CONNECT digital platform which provides overflow programming.